Skype is a instant messaging client and voice-over-IP service. It is developed by the Microsoft Skype Division. It was released in August 2003. How to Download and Install Skype on PC ? 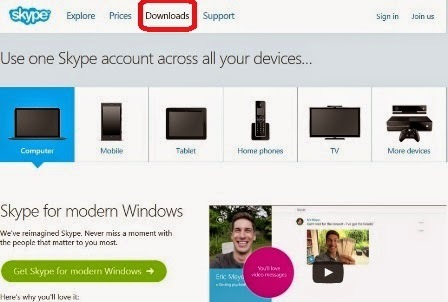 How to Download Skype ? You can Download Skype for Computer, Mobile, tablet, Home Phones, TV and more. Choose your option. To Download Skype for PC Click on "Computer" option. A new window will open. 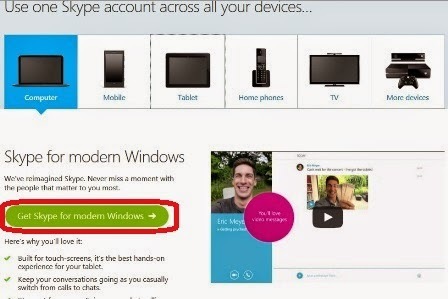 now Click on "Get Skype For Modern Windows" option. How to Install Skype on PC ? Open installer and let it download. Choose language and Click on "I Agree". Check "Install Skype Click to Call".